We keep over 50 types of paint and powder coat in stock. 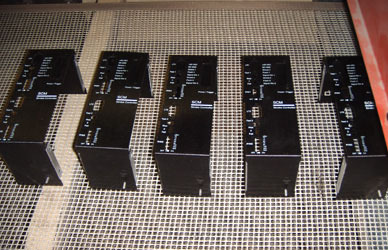 Prototek Manufacturing silk screens in-house to further control quality and delivery. We can design your artwork from scratch or utilize existing artwork or supplied silk screens. At Prototek, we have vertically integrated an anodizing and chromating system, powder coating and wet spray system and a 3-stage iron phosphate washer to allow us full control over finish on quick turn projects. Our plating room is RoHs (Ro-House) compliant, which is the new standard for environmentally friendly chemicals. We start with a 3-stage phosphate wash, which is critical in the pretreatments of all metals. It is a rust prohibiter and has great adhesive qualities to allow us to provide class 1 parts. 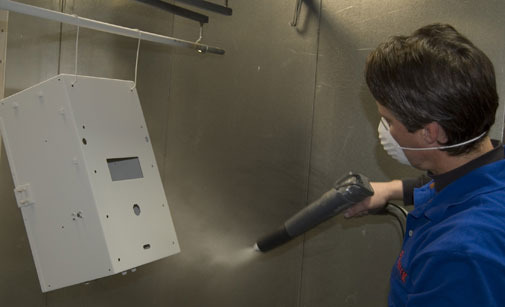 As with any form of coating, pretreatment is a very important step in the process. With over 20 years experience, we are able to ensure that these processes are kept at the highest level of quality, which we are proud to say is the end result.